Ziet er mooi uit Joes !! Love how you have set your blocks. It's beautiful. 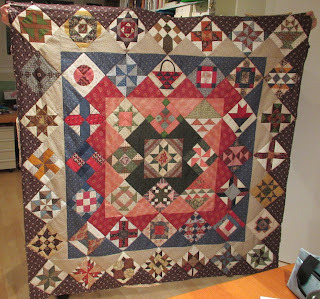 OH I love this quilt, great fabric choices, nice blocks! how will you quilt it? It's lovely! The colours are wonderful! Hello, this looks wonderful, I love the setting - beautiful quilt ! Prachtig Joes, mooie kleuren en bijzondere blokken! Such a beautiful quilt - it will be admired for years to come. Your workmanship and colors are wonderful! Mooi! Tot ziens in Nantes!